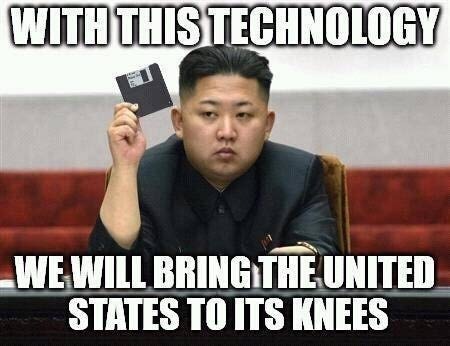 Sony Should Release “The Interview” Immediately to Cable, Internet, and DVD For Free – How Can People Be So Stupid? Anyway, this fat, insane, tin-pot dictator with bad hair in North Korea does not like a movie about his assassination. So what?! Plenty of people don’t like movies that were made about them. And, I can’t think of a “leader” that is more deserving of being “taken out”. (Ok, Abu Bakr al-Baghdadi, the leader of ISIS, also needs to be taken out, but he does not, yet (as far as I know) have nuclear weapons.) But, the idea that America is bowing to Kim’s demands is not only embarrassing, it is dangerous. Next, we will hear (backed by realistic force) demands from Putin. And, how about demands from ISIS. After all, there are something like 1.8 billion muslims, and at least 25 to 30% of them actually believe the crap in the Koran, and thus want a caliphate. Plus, many Muslims in countries like Egypt, Malaysia, Afghanistan and Pakistan have pledged allegiance to ISIS. (I predicted the new caliphate several years ago, during the height of the “Islamic Spring”, which I called the “Islamic Winter”). It is scary to realize how far America has fallen. 60 years ago, we were the greatest nation on the earth. Now, we are a laughing stock, having lost virtually every war since WW2, and apparently unable to stand up to even a murdering moron like Kim Jung-Un. Rather than showing the movie in theatres, since North Korea has apparently threatened violence to the theatres if the movie is shown, Sony should release the movie to cable, tv, dvd, and the Internet immediately, and for free! After all, they have absolutely nothing to loose, financially, since they have said that they are not going to release it to theaters, DVD, or other commercial outlets, so releasing it for free would not cause a financial hit. But, by releasing it, immediately, or, better yet, on Christmas day as was originally planned, they would spit in the eye of boy Kim Jung-Un and America would show that it fears nobody. And, of course, if North Korea carries out attacks, then we should send their leaders to Hell with immediate tactical nuclear strikes. Lets remember, if we had been smart, and used tactical nuclear weapons in Tora-Bora 13 years ago, we probably would not have had to piss away several trillions of dollars, and the lives of thousands of American soldiers, in Afghanistan. Everyone is terrified of tactical nuclear weapons, but they would have been perfect in Tora-Bora and other similar locations where there were no significant civilian populations within a few miles. (Yes, I said miles. Tactical nuclear weapons don’t destroy thousands of square miles, and kill everything within thousands of square miles of “ground-zero”.) If we had used tactical nuclear weapons in Afghanistan in the early 2000’s, we would have saved well over a trillion dollars and thousands, or maybe even tens of thousands if you include Muslims, of lives. And, bin Laden would have been dead a decade earlier. Of course, he might have been “vaporized”, rather than just double-tapped in the head, but he would have been dead. And, in either case, we would not have seen the evidence. And, as far as Afghanistan is concerned, now that we are leaving, it is clear that the Taliban are taking over, again, and it is retuning, full steam, to the Islamic hell that it was before 911. This is just the same as what happened in Iraq once we left, as I predicted. It is time to either stand up as a proud America, or just give up and give in to the Muslims and communists. Posted in: 911, Abu Bakr al-Baghdadi, Kim Jung-Un, North Korea. ← How to Safely Deep Fry a Turkey: Use a Drone!